Today I'm playing along with My Favorite Things Sketch Challenge #333. I needed an encouragement card so I used the MFT Sketch print for it. To create this A2 card, I began by white embossing the background stamp on a watercolor panel and then used come cobalt blue and veridian green to color it. Next I used die cut the panel with a diagonal coverplate die so I'd have some strips going in the right direction following the challenge sketch. I used die cut additional white cardstock rectangles to give me room to add the sentiment and focal elements. 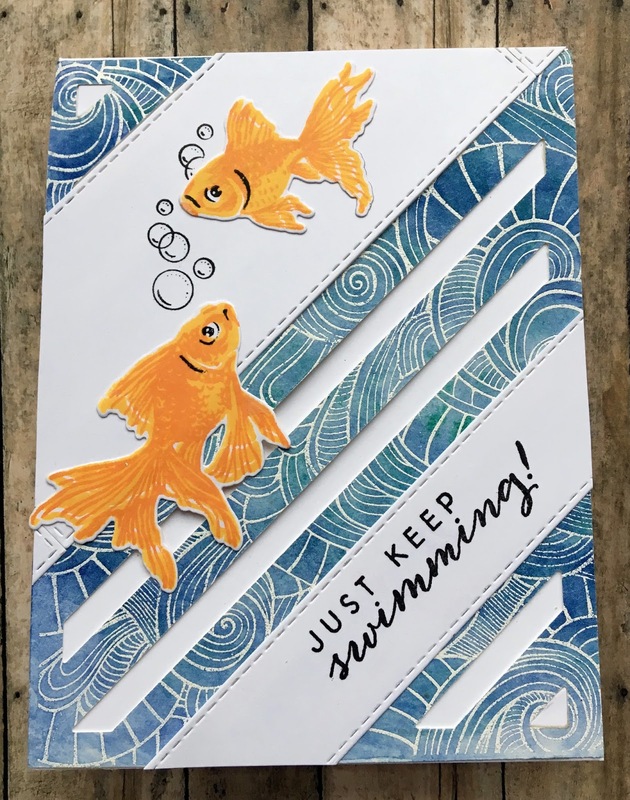 I die cut the little goldfish from another set and used the sentiment from it as well. I found some bubbles that I liked better from yet another stamp set and we're done. I wasn't sure at any point along the way as to what I was doing so it turned out to be a bit more work than I thought it would be, but it was fun. Materials list follows.